Honestly, I’ve never purchased any of these vegetables. 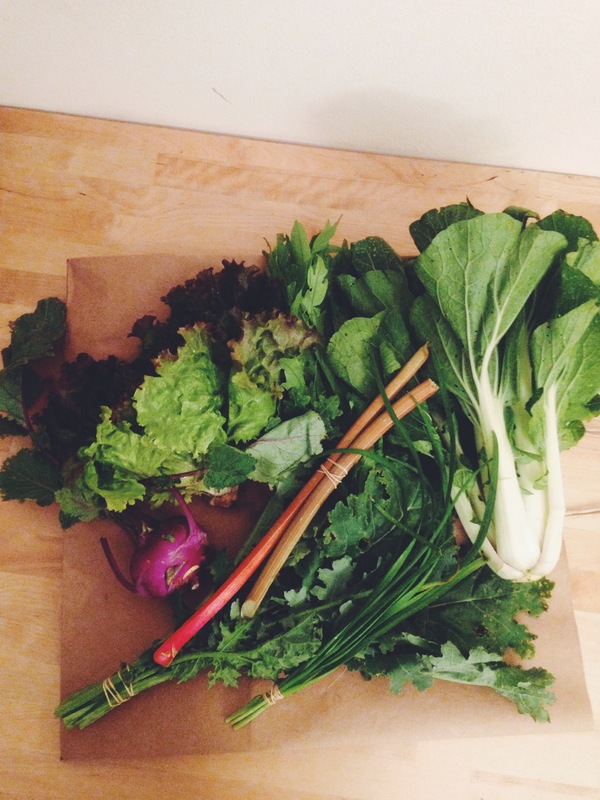 I had eaten bok choy once when my college roommate, Maureen, and I exchanged homemade dinners. I’ve never touched rhubarb, not even in a muffin. Suffice to say, I’m in for some new experiences. This week’s “Most Foreign Object Award” goes to the kohlrabi. In the above photo, it’s the round purple object with tentacles. After researching, I learned it’s a pretty versatile veggie. Inside its thick skin lies a crisp, juicy vegetable that can be eaten raw or cooked. It’s a member of the brassica family, which includes other nutrient-dense cabbages (as well as kales, brussels sprouts, broccoli and cauliflower) whose phytochemicals are highly regarded for their antioxidant properties. It’s important when you cook with kohlrabi to peel it thoroughly. Beneath the thick, hard skin is another fibrous layer, which should also be peeled away. I would describe it as a crispier potato with a cabbage flavor. 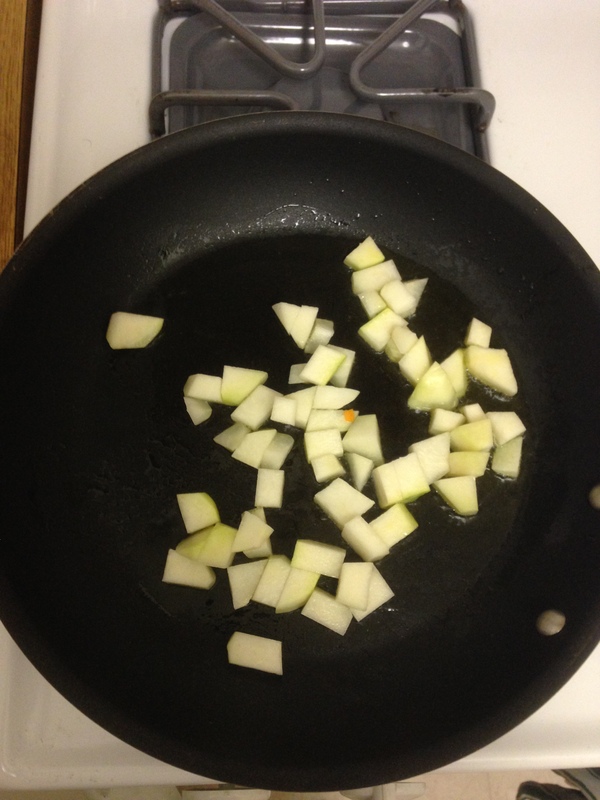 When I got home, I decided to throw together a quick stir-fry for dinner using the bok choy, kohlrabi, and chives. I had read that diced kohlrabi would cook up quickly in the skillet and I really couldn’t think of any other way to minimize my bok choy stash. 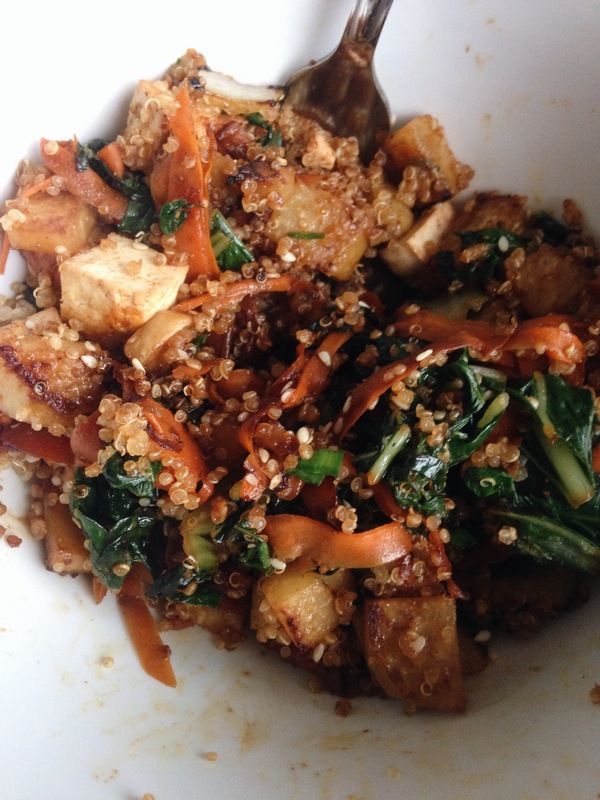 The resulting stir-fry was delicious! I would love to get kohlrabi again next week and experiment with a different sauce. It provided a hearty vegetable backbone to the dish. I’ll put the recipe below in case you find yourself with a purple alien in your grocery bag. For the remaining items, I plan on roasting the rhubarb with honey to add to a goat cheese and spinach salad which leaves kale and lettuce for green smoothies! Add garlic and ginger, once fragrant stir in bok choy and soy sauce, allowing bok choy to reduce and soften. Lastly, add tofu to the skillet. Allow to brown to liking. Finish the dish by stirring in hoisin sauce and half the chives. 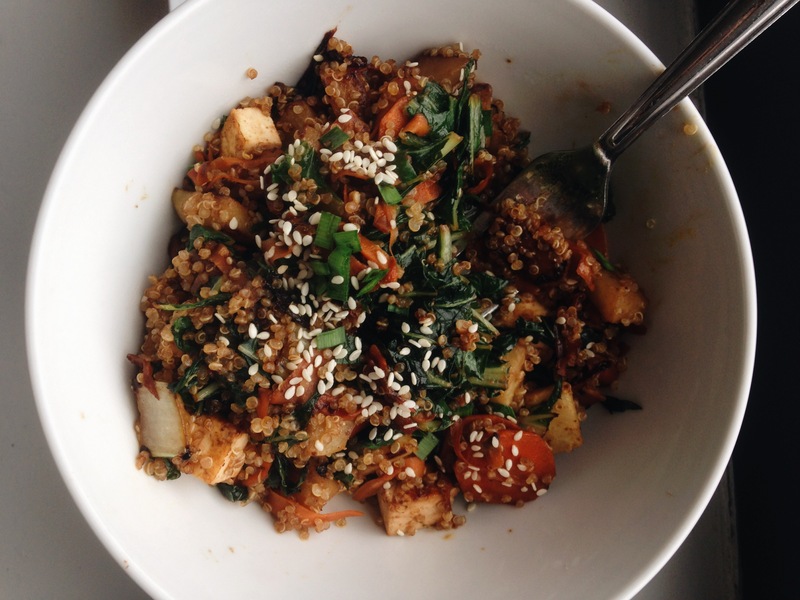 Optionally, you can throw in some cooked grain, like quinoa or brown rice. Top with sesame seeds and remaining chives. You are so creative!! Can’t wait for future veggies! My mom LOVES kohlrabi. Ever since she started getting it in her CSA share last summer it’s one of her favorites, I should ask what she does with it all since it sounds like a recurring character in the CSA lineup.